The Oeser Company is a manufacturer of Coastal Douglas Fir and Western Red Cedar utility poles. 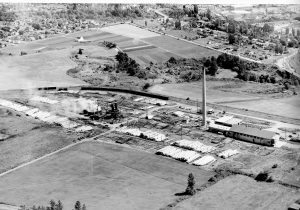 Our corporate office, pole manufacturing, treating plant, and storage facility are located on a 26 acre industrial site in Bellingham, Washington. 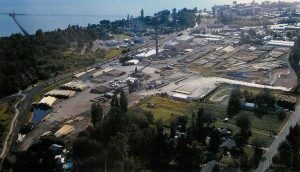 Bellingham is conveniently located between Seattle, Washington and Vancouver, British Columbia. We have the privilege of living and operating in the beautiful Pacific Northwest near some of the worlds best timber. Oeser’s outlook on our staff is to train the best and keep them happy. We believe that it is absolutely necessary to build a healthy well trained work force in order to maintain our excellent product standards. The average tenure for Oeser’s management is over 30 years and 14 years for our crew. While this is evidence of a stable work place, it also demonstrates our means for providing consistent product quality to our customers in every aspect associated with the management and production of utility poles. Since 1929, we have been growing and changing to meet the needs of the nation’s utilities. Founded on a commitment to our customers, we are ready to meet the challenges of the future with top service and quality from harvest to delivery. Our employees and customers are our focus and keeping this in mind, we look to maintain our level of excellence in the industry and continue to grow and innovate.